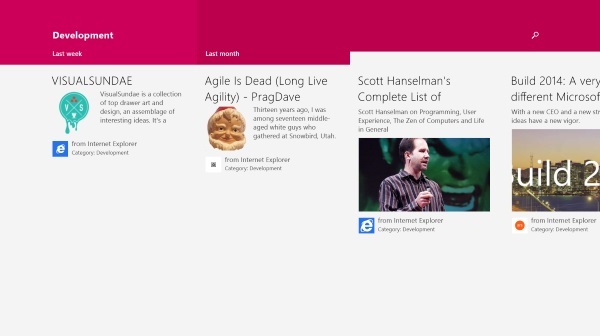 When Windows 8.1 came out it included an application called Windows Reading List, which used the Share functionality of Windows to bookmark articles which can be read later. Any application that shares the right kind of information can be used with Reading List, but the applications I use most often are Internet Explorer, Flipboard and the Bing applications. When you share an article to Reading List it asks you which category to use. I have set myself up with categories for software development resources, health and fitness information and general inspiration for life and work. Adding articles on either Windows or Windows Phone will use your Microsoft account to synchronise automatically. This is completely seamless in both applications – meaning there are no options to configure these settings at all. I’m quite happy with this, but I know that some power users would prefer the option to choose how the information is synchronised with their computers. 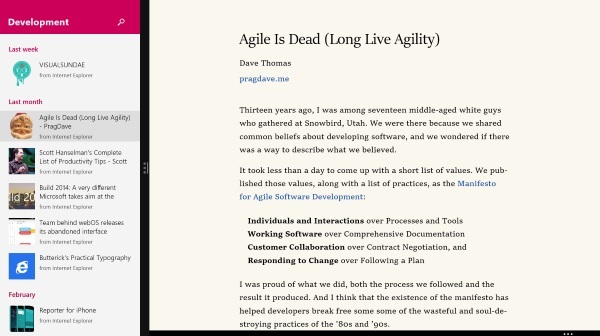 When you use the application on Windows, clicking on one of the articles will open up another window next to the snapped reading list. I love this feature, and it really goes to show the strengths of multitasking with the modern interface in Windows. Doing the same on the phone just opens Internet Explorer, the related application, or prompts you to search the store if you pick something that is incompatible. For example the Bing Wikipedia app isn’t currently available on Windows Phone, so clicking articles from this app prompt you to search the store. The addition of the Windows Phone version of this application has really increased its use for me, however it’s obvious uses are diminished when used with older versions of Windows. At work I use Windows 7 for my development machine, and there’s no way I can share interesting links found here with my Reading List. While I’m not expecting Microsoft to create a desktop app, a simple bookmarklet or browser extension would certainly do the job for collecting new articles to be read later. Since I don’t have W8 at work, and they probably wouldn’t allow personal cloud apps like this, I’d really love to have a bookmarked that send a webpage URL to my personal W8 reading list so I could read it on my personal PC or on my WP8 phone.